We live on a small acreage called "Sunnydale" near the vineyards in Newcastle's Hunter Valley region. After two years of discussions, an eight week old Border Collie puppy that we named "Ben" (Scaysbrook Ben Ledi) came to live with us. Little did we know what would happen to our lives from then on! Ben adopted Brett from the outset and I was feeling a little left out so in 1997 "Shiva"
(Ch Scaysbrook Rambling Rose CD JD AD) arrived and we haven't looked back since. Conformation and Performance sports now take up most (or should I say all) of our spare time, I concentrate on conformation while Brett devotes his time to the performance arenas and these dogs amaze us with their adaptability. 2000 saw the birth of Benshiva's first litter. Shiva was mated to the beautiful Gr Ch Danbeth Fullstop and we were blessed with 8 healthy puppies. Holding those little bundles of fur in our hands we finally understood the awesome responsibility that we have as breeders to maintain and work towards improving our breed. We produced our wonderful Webster and Buffy from this our first litter and have strived to keep edging forward with each litter we produce. Brett's favourite band of all time is INXS so with every litter that we breed at least one of the puppies is named after an INXS song. For those INXS fans amongst you, visit our litters page and try to find the song in each litter!!! Through our love of Border Collies and the places they have taken us we have met some wonderful people whom we have the pleasure of calling our friends. Please take the time to visit with some of them via our Links page. These beautiful, intelligent and very loyal dogs are an absolute joy to own and we highly recommend them to the right people. With their exuberant personalities and zest for life they are unfortunately not the right kind of dog for everyone and we suggest doing some research into the breed before approaching a registered breeder for a puppy. 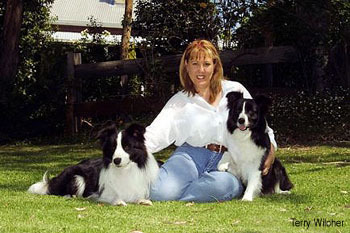 We are committed to breeding quality Border Collies, focusing on type, temperament and good health. We take full advantage of all genetic testing available to us to ensure that we breed healthy Border Collies. All our breeding stock is tested for CEA, TNS and CL or, is clear via parentage. All our breeding stock is hip and elbow scored and has a Gonioscopy test as well. We sometimes have puppies available to appropriate homes only. Please visit our puppies page for details and whilst there read our Terms and Conditions.